Interested in helping future pharmacists? The first 5th-year placements of the new integrated pharmacy programme will begin in January 2020. 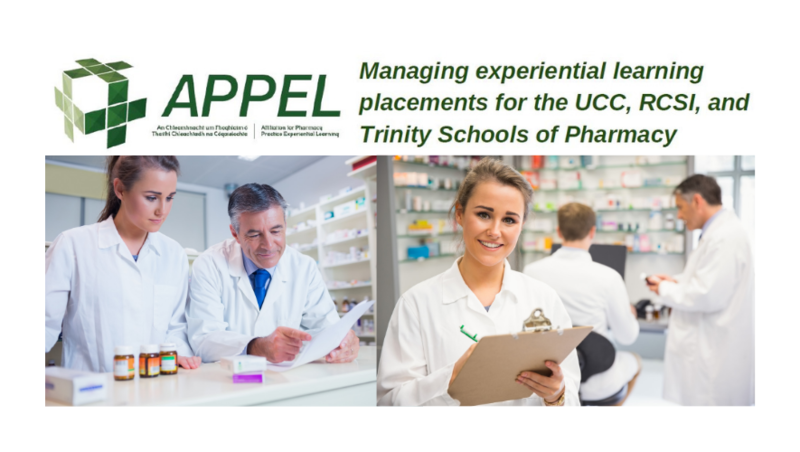 APPEL is now accepting expressions of interest from pharmacists who would like to facilitate an experiential learning placement for a 5th-year pharmacy student. The first cohort of students on the new integrated pharmacy programme are about to reach their final year. APPEL are excited to support students in one of the last “firsts” of their pharmacy degree, their final experiential learning placement. Students will have previously completed a 2-week placement in 2nd year and a 4-month placement in 4th year and are now looking forward to completing their 8-month 5th-year placement. * Continuing Professional Development – APPEL Trainer Training can contribute to your CPD, as can the experience of facilitating a placement. * Development of your talent pipeline – 5th-year students are close to completing their studies and may soon be looking for their first role as a pharmacist. * Engagement – participating in the APPEL programme provides you with the opportunity to increase awareness of your pharmacy/organisation. APPEL training and events provide fantastic networking opportunities to meet with your current and future peers. Applications are invited for this two-year (part-time) distance learning Master’s Degree offered by the School of Pharmacy, University College Cork course, commencing in September 2019. The course is structured to provide specialist training to enable pharmacists working in hospital and community pharmacies, extend their professional role within the evolving clinical healthcare system. The course will develop a greater understanding of the major pharmacotherapeutic issues of various disease states in order to develop a greater understanding of the particular needs of patients with these diseases. It will also provide graduates with the skills needed to become leaders in clinical pharmacy services, such as critical appraisal of drug therapies, rational drug use (including pharmacoeconomic evaluation), medication safety management, research project management, presentation skills and report writing. The distance learning format allows students to remain in employment throughout the course. Students will be able to communicate with each other and the teaching staff by means of regular teleconferences/webinars and interactive internet systems. Applicants must hold a primary pharmacy degree and ideally, should have a minimum of one year practical experience. Applicants must be registered as a pharmacist with the professional accreditation authority in the country in which they are practising. Further information about this course is available here. Closing date for applications: 30th June 2019. Applicants must apply online at www.pac.ie/ucc . Full details of the applicant procedure are available on this website. 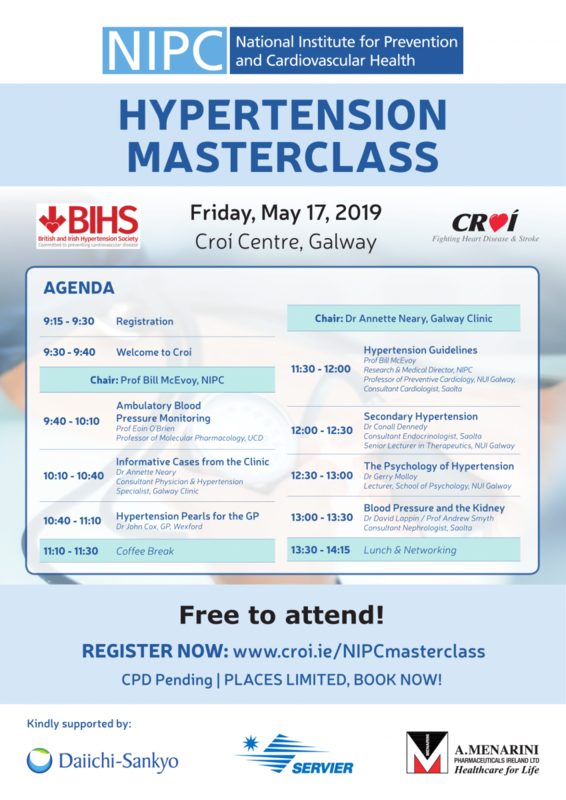 For further information please contact Dr. Teresa Barbosa (Programme Director, t.barbosa@ucc.ie; + 353 21 490 1792), School of Pharmacy, University College Cork, Cork, Ireland. A number of updates have been made to the functionality of the NPSO Learning Zone to make it easier to navigate and access relevant learning content to support you in your role. All courses are now accessible directly through the homepage, so you no longer have to go through the catalogue page. The National Patient Safety Office is committing to ensuring it offerers the most relevant learning opportunities and plan to add new resources to the Learning Zone later this year. The All Ireland Institute of Hospice and Palliative Care (AIIHPC) Early Career Researcher Forum (ECRF) is open to all researchers or clinicians from any discipline who consider themselves in the early to mid-stages of their research career in palliative and end of life care or whose research may influence people with palliative care needs. The Forum, which is multidisciplinary in nature and has members from across the island of Ireland, is constantly expanding and we want even more researchers to join and benefit from this collaborative community of peers. There are no membership criteria to join the ECRF. The ECRF: "provides an environment for support, advice and signposting…Some of the challenges for early career researchers in palliative care in Ireland…include securing opportunities to network with key experienced researchers in the field to benefit from their expertise and to also establish collaborations for future research studies." Dr Helen Kerr, Early Career Researcher Forum. For people who wish to join, there is an online form to complete, which can accessed here.